Well, I thoroughly enjoyed doing Unit 1. I got 84% in my first go at the end of unit test and went back to revise what I’d got wrong. 100% second time thankfully and got access to Unit 2. Lesson 1 covers European herbs and briefly tells you about Chinese and Ayurvedan herbs. It explains how herbs fit into our modern life. 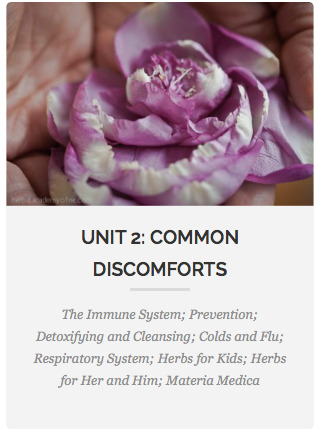 Lesson 2 is about sourcing herbs and the equipment you’ll need to make the remedies. Most of this you’ll already have in the kitchen, I know I haven’t had to go out and buy anything special. It also covers making a Herbarium, which is a great idea. I’m going to start with what I have in my garden and what I know for sure, then expand it over the years. I’ll probably use photographs as well as pressing flowers. It really is a great way to learn to identify your herbs and plants. 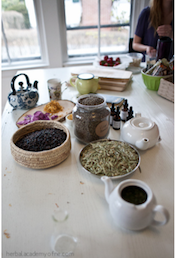 Lesson 3 is about making teas and tinctures. There’s two demonstration videos and downloads of a tea book and labels which you can print off yourself. 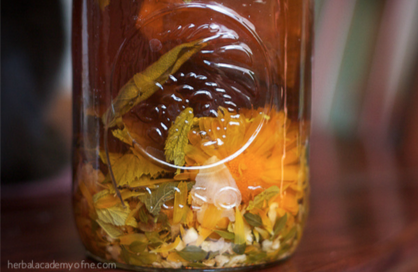 Lesson 4 is making syrups and external remedies - more downloads and recipes. There’s cough remedies, bath soaks, salves, oils, steams, poultices to try and some information about using essential oils. Lesson 5 explains the terminology common to herbalism, gives descriptions and example herbs that treat conditions. It’s quite an intensive thing - Herbal Actions, but there’s an infographic to help you take the information in. Lesson 6 gives information about trees, fungi, seaweed and a neat first aid guide - very interesting. Lesson 7 explains about anatomy and how our various bodily functions interact - stuff you probably know in isolation, but it’s very interesting to revise. An extra about Native American Herbs and then the quiz/test - as I said, failed first attempt but got it right second time. I did help myself to pass second time, in that I wrote down the answers I’d got right, then revised the ones I’d got wrong! There’s fabulous downloads, guides for what herbal tea treats what condition, the first aid section. It’s so comprehensive. 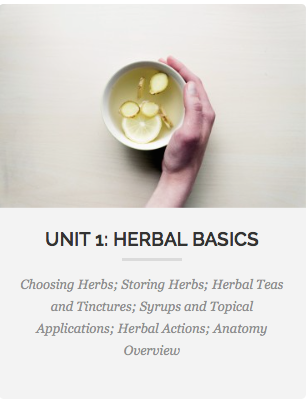 I’ve had a quick scan through Unit 2 and there’s more than I thought there’d be - see the photo below of the content - click on it to return to the HANE Introductory Herbal Course page and read about it. 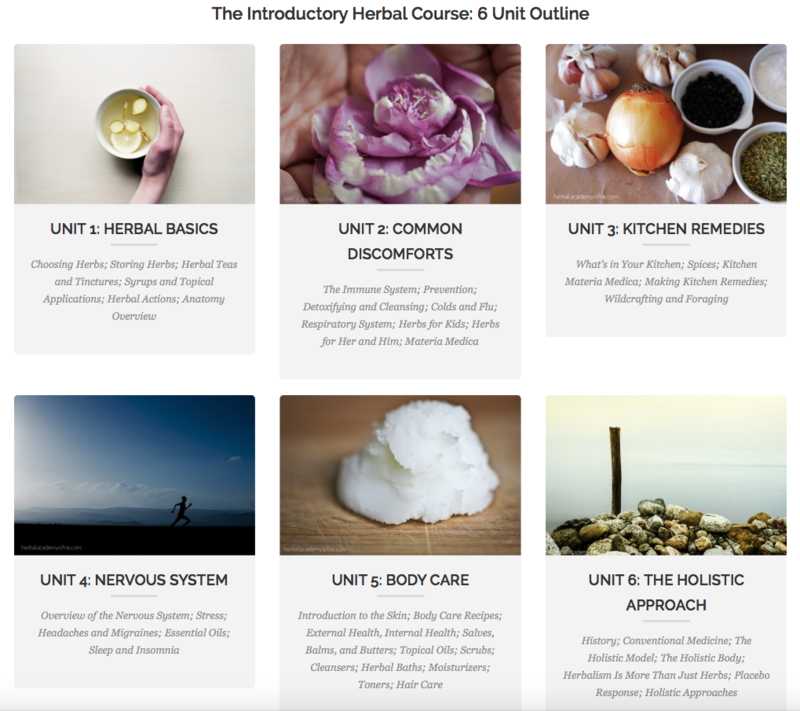 If you're interested in finding out more about this herbal course, then click on the photo below which will take you to the HANE website where you can read about the course, see what else is on offer and download a free sample lesson. If you have any questions regarding any aspect at all of this course, then please get in touch. If you want to know if a specific remedy, recipe or topic is included, what the answer to a question is (!) or any random thought you have, please use this box. It is a fabulous course and I'm certain that you'll love it.